BAYFIELD – Candles shone in the darkness as more than 150 people turned out for a vigil for missing 13-year-old Dylan Redwine on Tuesday evening at Eagle Park in Bayfield. The ceremony marked the first public appearance by Dylan’s father, Mark Redwine, who was the last to see his son at about 7:30 a.m. Nov. 19. Like many who spoke, he referred to Dylan in both the present tense and the past tense, reflecting the uncertainty everyone feels about Dylan’s fate. A number of students who had attended Bayfield Middle School with Dylan before he moved to Colorado Springs with his mother and brother this summer described the missing teen as kind and nice. A picture of a boy who was the class clown also emerged with tales of Dylan loving unicorns and teasing friends. Dylan’s former classmates have had a tough few years with the deaths of fellow middle-school students Madeline “Maddie” Milner in a skiing accident in 2010 and Shaniah Farmer in a car accident in 2011. Two pastors, the Revs. Dan Straw and Brian Caselles, offered prayers, a reading from Philippians and words of comfort. Straw was the only one to give voice to one of the community’s deepest fears, that Dylan has been abducted. Hess asked attendees to put one of the fliers about Dylan in the back window of their cars and announced a Find Dylan Redwine account has been established at Wells Fargo Bank to help pay for search expenses. Anne Cook, who has been helping organize volunteers at Vallecito Reservoir, said everyone has the impression that the search is over, and nothing could be further from the truth. Despite all the tears and fears, the community is still holding out hope. 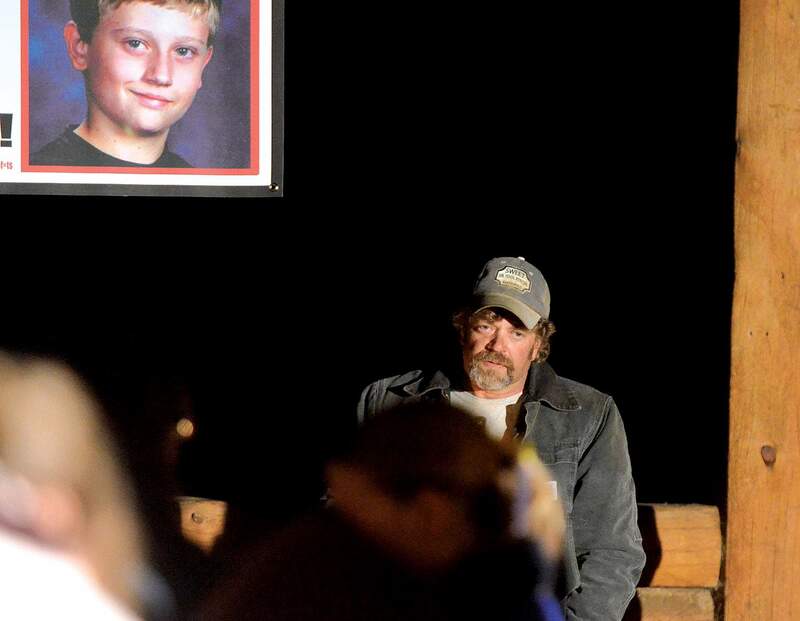 “That boy was my whole world,” Mark Redwine, the father of missing teen Dylan Redwine, told a crowd gathered for a vigil for his son Tuesday night at Eagle Park. 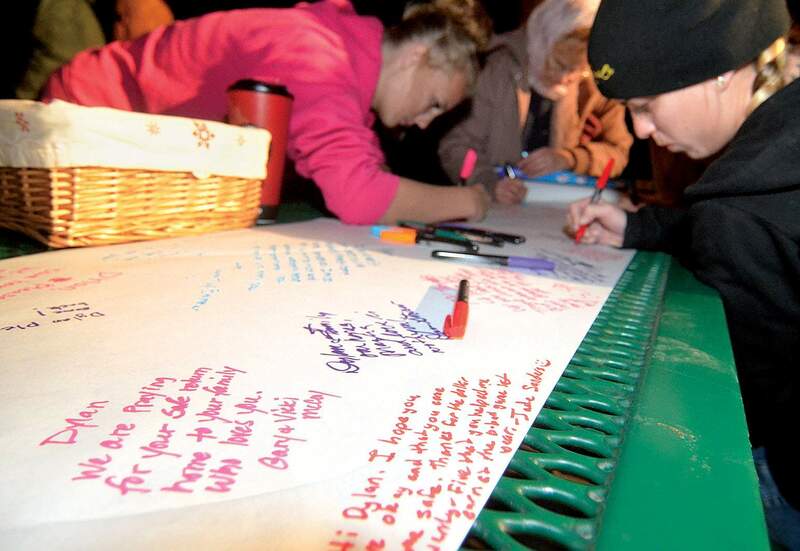 About 150 friends, classmates and other members of the community joined in a vigil for missing teen Dylan Redwine on Tuesday night at Eagle Park in Bayfield. Afterward, many left messages for Dylan and his family.